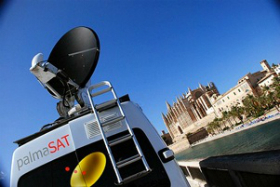 Palmasat Mallorca: HD SNG transmission/production services. Palma de Mallorca, February 2015: The Mallorca-based broadcast services company, Palmasat, has invested in new transmission and production equipment in order to launch this month a video news agency. To prepare for the launch, Palmasat has invested in two new Adtec Digital encoders for its SNG trucks as well as investing in the KA-sat Minicaster streaming solution. At its disposal, it has two ENG crews using Sony XDCam HD 422 with full audio and lighting equipment and a new HD post-production facility in the centre of Palma de Mallorca – providing FCP Studio and Adobe Production Suite. The company believes the new facilities will offer considerable benefits to its clients. “With the upgrade of the encoders in our SNG trucks and the new KA-sat and post production facilities, Palmasat can now offer clients unrivalled broadcast services 24/7 in Mallorca and on the Balearic Islands as well,” said a spokesman.